Please browse our comprehensive range of readymade curtains in both Pencil Pleat and the more recent revolutionary Eyeleted curtain format. We have something to suit all tastes whether you prefer traditional or more contemporary curtain style. We have curtains to suit any room in your home along with an extensive range of curtains for bedrooms with matching duvets covers. We also offer an extensive range of floral, pattern; chintz and plain curtains in both eyelet and tape top (Pencil Pleat). Our children’s range is unrivalled for both curtains and for the matching bed linen. 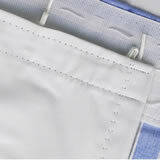 We can even offer to eyelet any 66" width pencil pleat curtain at an additional cost. Eyeleting larger pencil pleat curtains is also available but you will need to call us to make further inquiries. Or number is 091539633 and ask for the curtain department. Under the category Metal Curtains and Accessories we sell a large range of curtain poles and accessories in a variety of metal finishes along with artful finials. We sell Wood Curtain Poles and Accessories too in a variety of wood finishes and finials. 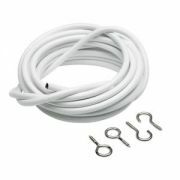 Need additional rings or curtain hooks? Not a problem, you will find them all here. For those of you who like to be creative check out our Roman Blind Kits. It includes everything you need to make your own roman blinds. All you need to do is buy your own fabric. 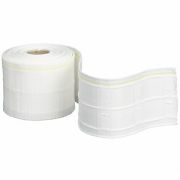 We also sell Rufflette tape for those more adventurous, who want to make their own pencil pleat curtains. Don’t forget to buy your curtain accessories such as gliders and hooks (if you need extras) when you are making your own curtains. Our plastic rails and curtain tracks from trusted suppliers like Swish and Regis are also available to buy here. Most of the rails for sale on this site include the full kits so everything you need to get started is within the set including brackets. Have awkward window sizes? Not a problem check out our great range of tension rods we have in stock which allow you to hang net curtains without the hassle of cutting down rails and tracks. Simply twist the rod tension to spread the width till you get a snug and secure fit. Finally we have an extensive range of great value net curtains in a variety of designs and drops. Be careful when choosing your netting that you select the right drop (height) as the width is cut to order. Check out the net curtain section to find out more. We also sell muslin by the length which is great for jam making and cooking the perfect golden goose, turkey or chicken for those precious family get together. Simply soak in butter and cover the roast for a snug fit. Anthony Ryans are the selected retailer for the Luxaflex Blinds. Luxaflex® Window Styling systems offers the most comprehensive portfolio of custom made window covering solutions including: indoor blinds, insect screens, and outdoor screens and awnings, to beautifully complement any personal style, interior design, and type of window. Furthermore, Luxaflex® offers the widest array of innovative lifting systems for easy operation and enhanced child safety. From cordless and retractable manual operating systems, to cord tensioners, wand controls and motorised operating systems.